New York | Mumbai, April 21, 2016: Tata Consultancy Services (TCS), (BSE: 532540, NSE: TCS), a leading global IT services, consulting and business solutions organization, has received the 2016 SAP® Pinnacle Award for ‘Run SAP Partner of the Year’ for the fourth year in a row, being recognized for its outstanding contributions as an SAP partner. SAP presents these awards annually to the top partners that have excelled in developing and growing their partnership with SAP and helping customers run better. 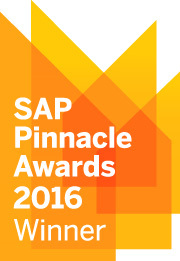 Winners and finalists in 19 categories were chosen based on recommendations from the SAP field, customer feedback and performance indicators in the following umbrella categories: Build, Service and Sell, with each category including a Customers’ Choice award, which recognizes a customer-nominated SAP partner. In addition to these esteemed SAP accolades, TCS was recently recognized by Gartner as a Leader in the Magic Quadrant for Worldwide SAP Application Management Service Providers for the third year in a row. TCS is one of the largest and fastest-growing partners of SAP with more than 15,000 dedicated SAP consultants. TCS has more than 550 SAP projects around the world that serve as world-class proof points of the results generated for clients. TCS is proud to be a SAPPHIRE-level sponsor of SAP’s flagship conference and the exclusive sponsor of the SAP concert at SAPPHIRE NOW with Coldplay.